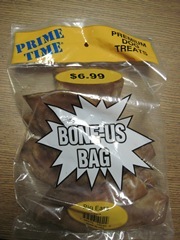 Dog Food Recall Alert 2011 - More Pig Ear Dog Chews Recalled! Blackman Industries, Inc. of Kansas City, KS is recalling all quantities of two brands of pig ears because they have the potential to be contaminated with Salmonella. The recall is a result of a reported illness of a dog in Missouri who consumed pig ears from the same production lot but from product sold by a different distributor, Keys Manufacturing Company Inc. It was found that a batch of the pet chews tested positive for Salmonella. 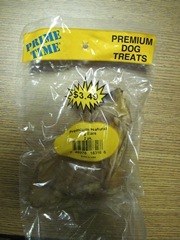 See: Keys Manufacturing Company Inc. - Dog Food Recall March, 2011. To date, only this one illness has been reported. PrimeTime Premium Pig Ears - 2ct. and 5ct. 7-48976-18316-6 on a 2 ct. package with a $3.49 retail price. 7-48976-09040-2 on a 5 ct. package with a $5.99 retail price. 7-48976-19040-9 on a 5 ct. package with a $6.99 retail price. KC Beefhide - 20 ct. The KC Beefhide product is packaged in a red mesh nylon bag with a green and white header that says KC Beefhide and has the UPC code 7-48976-09065-5. Feldman’s Farm and Home Stores. Keys Manufacturing Co. and the FDA are continuing the investigation to determine what caused the problem. "Salmonella can affect animals and there is risk to humans from handling contaminated pet products. People handling dry pet food and/or treats can become infected with Salmonella, especially if they have not thoroughly washed their hands after having contact with the chews or any surfaces exposed to these products.